We use the finest materials and metalwork to custom manufacture and install stunning, secure and reliable automated domestic and commercial gates across Kent, London, Surrey and the surrounding areas. Working with the best quality steelwork, we fabricate all kinds of gates, from classic black double gated driveway entrances to simple and small garden pathway gate systems. With our in-house design facilities, customising metal installations is a relatively simple process; all you have to do is tell us what you want, in just about any finishing colour you choose, and we will take care of the rest. When we are going through gate designs for our customers, we are able to fit automation equipment to them to give you the chance to open the gate without doing everything manually. This is a very popular add on to our domestic security gates to give homeowners and commercial properties across Kent and London more protection from outside threats. Call us today on 01233 633 299 and one of our experts in metal fabrications will be able to talk everything through with you. 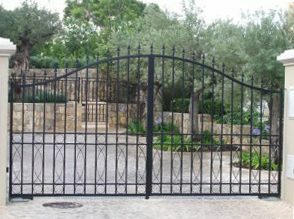 We guarantee the finest custom metal gate for your home or business. Typically working with architects, property developers, designers and, of course, the client, we provide a comprehensive custom fabrication and gate design service based on over 25 years of industry experience. Once fabricated, we provide a complete installation service for your new gate system, bringing all the materials on site, installing fittings into a current garden wall or new metal fencing and ensuring a level and smooth opening fit. We create and supply all our custom made gates with the optional addition of gate automation; ideal if you don’t want to get caught out in the rain! Activated by the simple press of a remote control button, our automated gates will quickly and smoothly open and close, enhancing security while at the same time improving ease of access for you. For added security, our automated gates can be linked up with a specialised electronic access control system. This will create secure and convenient access to your home or business premises via an entry phone or coded keypad system. Based in Ashford, we design, manufacture and install high quality security gates and electronic automation systems to commercial businesses and homeowners in Kent, London and Surrey including Sevenoaks, Canterbury, Tonbridge, Maidstone, Bexleyheath, Tunbridge Wells, Folkestone, Chatham, Dover, Rochester, Medway, Gillingham, Dartford, Orpington, Rainham, Bromley, Gravesend and the City of London. Whatever your automated gate requirements, contact us today to arrange a free no obligation property survey and quotation at a time to suit you.